Do You Really Interview Customers? 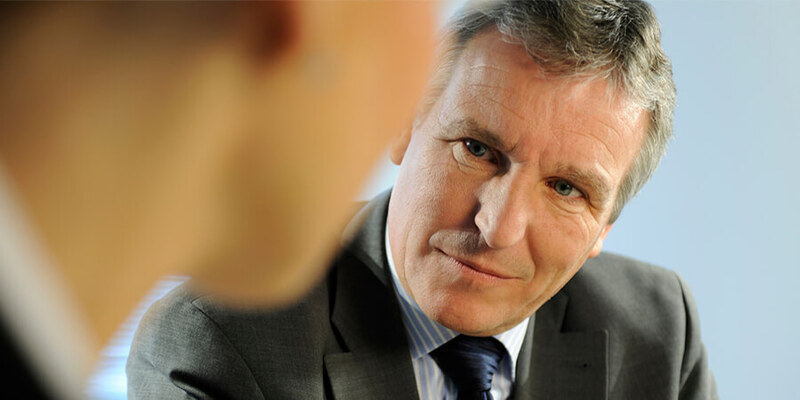 - The AIM Institute Do You Really Interview Customers? The AIM Institute > Insights > Blog > Customer Insights (VOC) > Do You Really Interview Customers? Do You Really Interview Customers? What if your company could pick just one competency to truly master? What would it be? Acquisitions? Perhaps, but if you buy businesses and then can’t grow them, you’ll just build a house of cards. How about operational efﬁciency or quality or service? These are important, but if others match you—and they usually do—you’re in a race to the bottom of a commoditization spiral. I ﬁnd that most industrial leaders want proﬁtable, sustainable top-line growth, and they look to new products for this. But not product “tweaks.” They want differentiated products customers will pay top dollar for and competitors can’t match anytime soon. Now here’s the interesting part. Differentiated products must be… different. And yet, many producers behave the same as their competitors while hoping for different results. I don’t hear business leaders say, “Our R&D staff is 20% smarter than competitors’, so our products generally win.” And few plan to win by understanding customer needs better than competitors… which would let them “aim” their R&D brainpower better. That brings us to the subject of this brieﬁng: Customer interviews. Of all the ways to learn about customer needs—telephone, mail survey, internet—nothing comes close to face-to-face customer interviews. And if the information being sought is new, complex or ambiguous—as with industrial product design—the advantages of interviews become even greater. 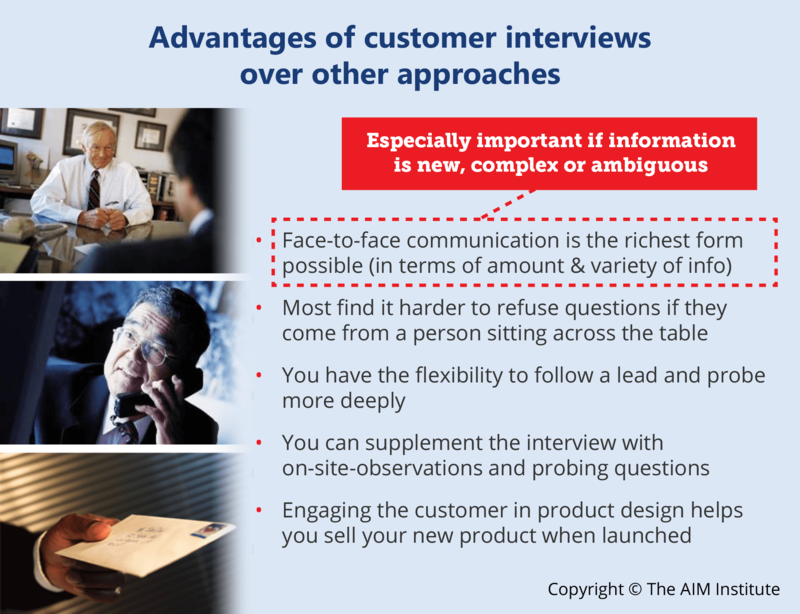 So is the customer interview a key ﬁxture in most new product development processes? For too many producers, the answer is no. Perhaps with so much routine customer interaction taking place, it’s assumed some of it must be interviewing. But if you examine the call frequency and objectives of your sales and technical service staff, you will most likely ﬁnd that over 95% of face-to-face customer communication is of the “tell-and-sell” variety. Some might protest, “But we get lots of input from our customers on what they want in new products.” As shown in the image below, the difference between that and what I’m proposing is the difference of night and day. 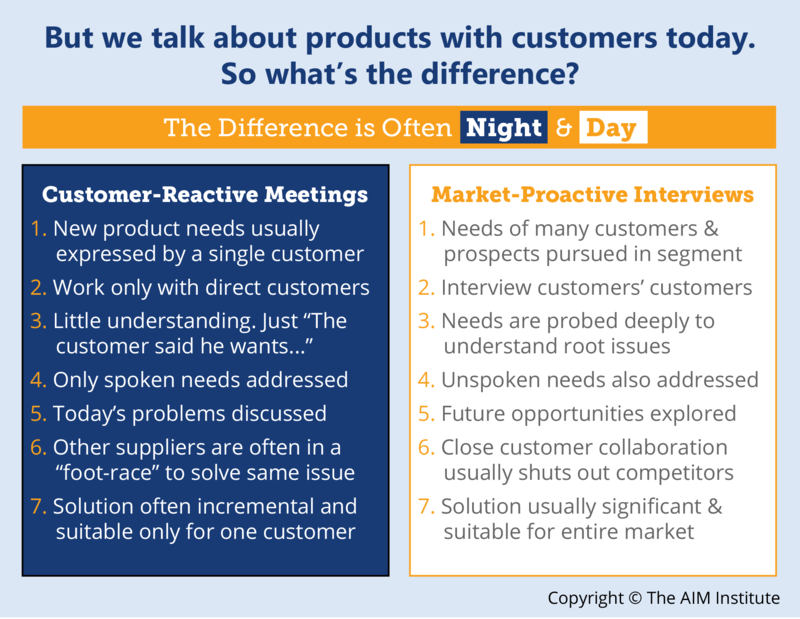 Most new product discussions are actually customer-reactive meetings, not market-proactive interviews. You’ll know one of these when you see it: First, a team targets an attractive market segment to pursue. Then it schedules interviews with customers, prospects and their customers’ customers. Two-person technical-marketing teams carefully prepare their questions and interviewing roles in advance. And that’s the point, isn’t it? If we just create products our customers ask everyone else for, and we haven’t cornered the market on R&D genius, we’re going to keep struggling with this differentiation. But if we intentionally and frequently expose ourselves to unexpected and surprising information–that our competitors lack–we can create much more signiﬁcant and protectable value. They throw more money at R&D: Don’t skimp here, but a Soviet-style arms race can be inefﬁcient and a poor gamble. They ask tough questions: Keep asking them… but if your new product teams are not asking these and many more questions before you do, be nervous. They exhort the troops: Fine, but don’t repeat quality mistakes of the 70’s. Deming railed against pep talks unsupported by employee training in new methods (e.g. statistics).Most employees need much more training, especially in practices for the aptly-named “fuzzy” front-end (predevelopment-stage). Many have been trained in a stagegate® process which provides good discipline2. But, gate review after gate review, isn’t something becoming painfully obvious? Many product teams simply do not know how to explore unmet customer needs very well.Imagine if teams were taught how to uncover customer needs, the practice was uniformly applied across your company and it was continually reﬁned to the highest possible skill level. You’d be doing things differently and you’d have more differentiated products. You’d have proﬁtable, sustainable top-line growth. We’ve only been able to touch lightly on the type of training needed. It’s about new interviewing skills, like active listening, deep probing and collaborative brainstorming. But it’s also about targeting the right market segment in the ﬁrst place, performing rigorous competitive benchmarking and building a bullet-proof business case prior to development. For more information and in-depth look at our in-house training, visit our In-house blended New Product Blueprinting and Voice of The Customer Training Workshops page.